1 Molecular Dermatology Research Center, Department of Dermatology, Shiraz University of Medical Sciences, Shiraz, Iran. 2 Department of Pathology, Shiraz University of Medical Sciences, Shiraz, Iran. We present a case of a 22- year -old female with 3 -month history of an asymptomatic erythematous plaque on the left eyelid, which was proven to be cutaneous leishmaniasis by smear. Cutaneous leishmaniasis can present in different forms, and is more common in the Middle East countries. Usually, it begins with small erythematous papule, then enlarges over several weeks to plaque or nodule then ulcer or verrucous appearance may follow. Making early and correct diagnosis is very important to avoid side effects like scars, which can be disfiguring. The diagnosis is made clinically and can be confirmed with smears and biopsy and treated with pentavalent antimonilas and other drugs. Our patient received Glucantime. A 22-year-old woman presented to Faghihi dermatology clinic for evaluation of a reddish lesion on the eyelid for 3 months that was not associated with pain or itching. According to the patient, it began with small red lesion on the left eyelid that gradually enlarged over several weeks. She had applied different ointments on the lesion, but with no improvement. She denied fever or any other symptoms. Due to the induration, duration of the lesion and endemic region where the patient came from, we suspected leishmaniasis and ordered smear of the lesion. Physical Examination: There was an erythematous crusted, indurated and well demarcated plaque on the left eyelid that extended to the per orbital region. There were no other skin lesions on her body. The lesion was not tender and the patient was afebrile. Also, ophthalmology exam was normal. (Figure1). Histopathology: In dermal scraping smear stained with Giemsa stain, leishmania amastigotes were seen along with some neutrophils and macrophages. (Figure 2). so a diagnosis of cutaneous leishmaniasis was made. Fig 2: Giemsa stained smear. Leishmaniasis is caused by more than 20 species of obligate intracellular flagellated protozoans named Leishmania. Female sand fly (Phlebotomus or Lutzomyia) bite (blood-sucking) transmits the protozoa to humans. These sand flies do not make noise when they fly and are active from dusk to dawn. Most cutaneous infections occur in the Middle East and tropical regions. Other forms are mucocutaneous (espundia, involving nose and mouth), diffuse cutaneous (only nodules with no ulcers) and visceral (involvement of liver, spleen and bone marrow).The reservoirs are dogs and rodents. In the middle east, L.major is responsible for the most cases of cutaneous leishmaniasis[1,2]. Lesions start as small erythematous papules at the site of bite, which enlarges over several weeks and become ulcerative plaque or nodule with dusky red surrounding skin. Rural or moist form is caused by L.major and has short incubation period(1-4 weeks)and rapid course. Spontaneous healing with scar usually happens within 6 months. In contrast, urban or dry type, caused by L.tropica, has longer incubation period (2-8 months) and heals slowly(up to 15 months). Leishmaniasis recidivans is a relapsing, resistant -to- therapy form of the disease and recurs at the site of the previous ulcer within 2 years, especially on the face in children, and destructs the tissue. 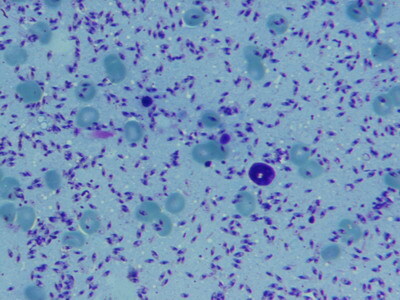 Lupoid leishmaniasis is similar to lupus vulgaris, both clinically and histologically, but with a few amastigotes seen in smear. Erysipelas and sporotrichoid types are also can be seen [1,2].There is different ways to confirm the diagnosis. A Giemsa-stained slide of tissue is the most common technique. Amastigotes can be seen with rodlike cytoplasmic kinetoplast. Other options are punch biopsy from the raised edge of an ulcer or polymerase chain reaction (PCR) that is rapid and the most sensitive technique. Also, Leishmania can be isolated from culture in special medium like Nicolle-Novy-Macneal. The disease is treated to reduce scarring, improve healing, and avoid secondary infection and to prevent recurrence or dissemination. Indications for the treatment are 1-more than 6 months duration 2-more than five lesions 3-lesions located over joints 4-large(4-5 cm in diameter)lesions. There are different treatments for leishmaniasis. Pentavalent antimonilas are the treatment of choice for cutaneous leishmaniasis, e.g. intramuscular (IM) Meglumine antimonite (Glucantime) for 20 days or sometimes intralesional injection for limited lesions .These medications has some side effects like abnormal LFT or ECG change. Other options that can be used are cryotherapy (liquid nitrogen),oral fluconazole, topical ketoconazole, topical paromomycin oral miltefosine, allopurinol, dapsone and rifampicin [2,3,4,5,6]. In our case, we made diagnosis clinically, based on the induration and duration of the lesion, lack of symptoms and endemic living place of the patient. We confirmed our diagnosis with Giemsa-stained smear. Unfamiliar physicians with endemic diseases in the Middle East may make diagnosis of some diseases like eczema. Regarding the location of the lesion, we decided to start IM Glucantime for the patient. We ordered the ECG and liver function tests (LFT) then Glucantime 60mg/kg/day IM was given for 21 days for the patient. Also the patient was told to apply ophthalmic tetracycline ointment to her eyelid to remove crusts. The patient was checked for LFT and ECG weekly. We reported this case to have a quick review on leishmaniasis treatments and to mention that leishmaniasis diagnosis should always be kept in mind as it may present in different forms. 1. Steven A Nelson , Karen E Warschaw. Protozoa and worms In: Bolognia JL, Jorrizo JL, Schaffer JV, editors. Dermatology. China:Elsevier;2012. p.1392-1395. 2. James W, Berger T, Elston D. Andrews disease of the skin. 11th ed. China : Saunders;2011.p. 416-417. 3. Monge-Maillo B, Lopez-Velez R. Therapeutic options for old world cutaneous leishmaniasis and new world cutaneous and mucocutaneous leishmaniasis. Drugs. 2013 Nov;73(17):1889-920. PMID: 24170665. 4. Hepburn NC. Cutaneous leishmaniasis: an overview. J Postgrad Med. 2003 Jan-Mar;49(1):50-4. PMID: 12865571. 5. Machado PR, Penna G. Miltefosine and cutaneous leishmaniasis . Curr Opin Infect Dis. 2012 Apr;25(2):141-4. PMID: 222489. 6. Masmoudi A, Hariz W, Marrekchi S, Amouri M, Turki H. Old World cutaneous leishmaniasis: diagnosis and treatment. J Dermatol Case Rep. 2013 Jun 30;7(2):31-41. PMID: 23858338.